Comparex Canada soared up CDN’s Top 100 IT Solution Providers list 35 spots to claim the Fastest Rising Star Award in 2017. The award was announced April 25 at CDN’s Top 100 gala event in Woodbridge, Ont. and presented to Comparex Canada’s General Manager Jason Mackay. The Top 100 list is ranked by annual revenues, and while exact revenues aren’t disclosed, the revenue ranges indicate that Comparex may have tripled its revenue over the past year, or even better. Revenue rankings are verified by IDC Canada in partnership with ITWC as part of the Top 100 benchmark report. Comparex started up its Canadian operation in August 2015, with the Leipzig, Germany-based firm hiring former Microsoft executive Mackay to lead the operation. Comparex was called upon by Microsoft Canada to bring a new type of partner to the country. The solutions provider focuses entirely on facilitating Microsoft cloud migration services, including Azure infrastructure as a service (IaaS), and Office 365 software as a service (SaaS) migrations. 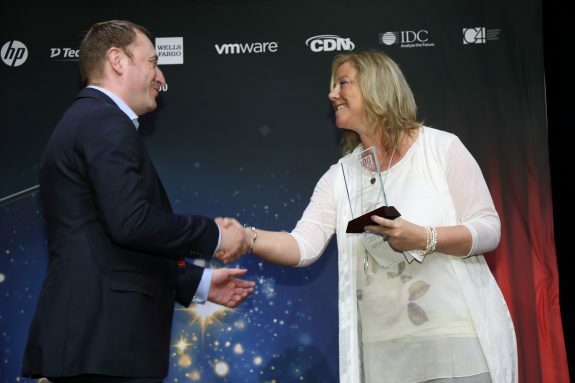 Comparex CEO Jason Mackay is congratulated by presenter Deanna Thomson, national director of channel sales at Dell EMC Canada. Mackay credits three factors for the rise of Comparex – the great people working there, tapping the global entity’s scaling resources after establishing a local presence, and a strong partnership with Microsoft Canada. Helping clients with digital transformation efforts, namely migrating to cloud computing services, Comparex offers both the technical capabilities and the people skills required. Its change management strategies cover off all the tough problems of getting employees to stop doing what they’re used to, and start following best practices with the aid of cloud solutions. A typical customer of Comparex is a mid-sized enterprise with 700 to 1,000 employees, Mackay says. That customer is driven by an executive-level employee that has a mandate to lead a digital transformation. Firms like this are looking to not just migrate to the cloud technology, but actually have their employees take full advantage of all that it has to offer and reap productivity gains that will show up on the bottom line. Comparex has grown its impressive revenues with just 21 employees. Mackay credits the global services organization for knowing how to scale its subsidiaries well.